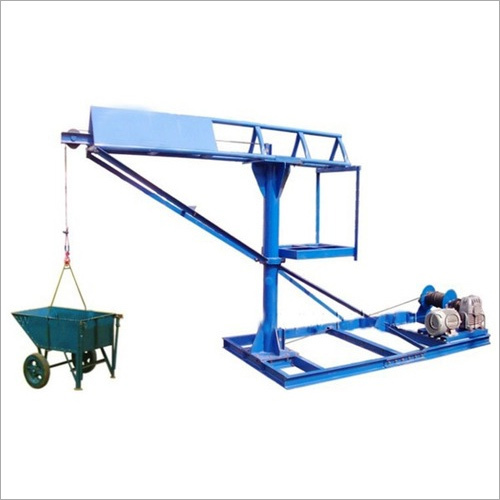 We deal in Monkey Hoist Machines, which are used for lifting of steel, concrete, bricks, cement, sand, tiles etc. These mini cranes are the effective tools employed for lifting various materials. Serviceable for the construction of multi story buildings and others, these are extensively employed in the construction as well as allied industries. Provided devices are utilized for the lifting as well as lowering a load via the activity of lift-wheels or drums. Provided Monkey Hoist Machines can be pneumatically, manually or electrically functioned as the highly flexible lifting mediums. Accoutered with lifting hooks, the machines insure dependability in their execution. Insure the correct placement, lifting and transportation of different materials. Simpler to repair, these are highly durable. Made for light to moderate utilization. Offered with a consolidated and durable construction. Lifting Capacity - upto 800 kg.